Waiting for Gen-III in the second half of 2009 but better watch the trademark! “EMCORE Deploys First Concentrator Solar Photovoltaic System in China with the XinAo Group” attracted my attention the week before Thanksgiving Day. It took two weeks to confirm the 50 kilowatt (kW) test and evaluation system installation from EMCORE Corporation (NASDAQ:EMKR) is located somewhere near the XinAo Group Head Office (web address found on ENF.cn) in Langfang, Hebei Province, China, about 50 km (kilometers) southeast of Beijing. EMCORE and XinAo continue to have discussions regarding the possible construction of a joint-owned plant in China, to manufacture CPV systems designed and certified by EMCORE for its innovative coal gasification project and the Chinese market. In early October, EMCORE was also granted access permits for its 850-kW commercial solar park installation in the Extremadura region of Spain. In addition to these two deployments, EMCORE expects several other pilot sites to be deployed by the end of the year. EMCORE continues its investment to develop a next-generation system design with enhanced performance (including a module efficiency of approximately 30%) and much improved cost structure. The new design (Generation III) is scheduled to be in volume production by the second half of calendar 2009. EMCORE has recently responded to several RFPs from public utility companies using Gen-III products as its baseline and expects to receive positive feedback on these proposals before the end of 2008. EMCORE’s trumpeting of large, low quality customer CPV deals such as with Green and Gold Energy (please see EMCORE’s Investor Presentation Slides 10 to 12 from the Piper Jaffray Cleantech & Renewables Conference or “EMCORE Receives $39 Million in New Orders for Concentrator Solar Cell Receiver Assemblies from Green and Gold Energy”) has resulted in a spate of shareholder class action lawsuits against the company beginning on Christmas Eve. With a considerable investment in the solar cell components we have a build capacity of approximately 250 megawatt cells to receivers and 1,000X concentration. However, this Terrestrial Solar Cell and Receiver capacity may exceed credible CPV demand in 2009 by a few times before accounting for production by III-V Multijunction Terrestrial Solar Cell rivals Spectrolab and AZUR SPACE Solar Power GmbH. In an effort to improve the market competitiveness of our CPV system product we have increased our engineering effort for the next generation CPV system design and qualifications. The cost for our Gen-III product is targeted at $1.75 per watt with a module efficiency of 30%. Even with the price erosion of solar modules, we still expect the Gen-III product to be very competitive. In effect, EMCORE will not be able to deploy large CPV systems for at least the first half of 2009 until Gen-III is ready and in production. Any increase in Terrestrial Solar revenues for the next three quarters will have to be generated by solar cell and receiver module sales. And crystalline silicon module pricing will be an attractive alternative to CPV systems if prices drop by 20 to 30 percent per Watt in 2009 as predicted (see “Suntech CEO: Solar Panel Glut to Slash Prices by 30% in 2009” by Josie Garthwaite at Earth2Tech for example). 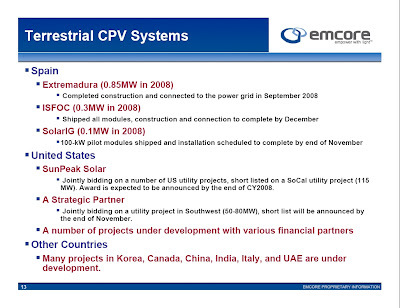 If the past (“Gen 3 Solar changes name to OptiSolar”) is a key indicator, EMCORE’s Gen-III designation for their next generation CPV systems is almost certain to cause a trademark conflict with DayStar Technologies (NASDAQ:DSTI). Flawed EMCORE Concentrator PhotoVoltaic System deal with the Pod Generating Group? Si ustedes quieren haber mas información sobra el sector de el fotovoltaico tienen que ir a veer ENF PV Directorio de la Industria (www.enf.cn) Tiene un directorio publicado en 7 idiomas mostrando los detalles de más de 5000 PV fabricantes e instaladores. Además en este sito están publicado muchos reportajes sobra el fotovoltaico y se puede conseguir un servicio de consulta para importar paneles chinos.